President Abdel-Fattah Al-Sisi is scheduled to assume the presidency of the African Union (AU) on Sunday during the pan-African organisation’s 32nd summit in Addis Ababa. According to a source within the presidency, Al-Sisi will use the occasion to assert Cairo’s commitment to promoting African interests and development, and underline the need for cross-continental efforts to combat terrorism and reinforce national state institutions. The last time Egypt chaired the AU was in 1993. Egypt — nominee of the North African states whose turn it was to select the chair — was chosen to head the organisation during a closed meeting in January 2018. “The choice reflected the fact that other North Africa countries are too consumed with internal affairs to want the presidency of the AU, as well as Cairo’s growing wish to maximise its association with its continent,” said a Cairo-based African diplomat. The diplomat’s remarks reflect a not uncommon scepticism among African states about where Egypt stands on the continent. Though many African diplomats who have spoken to Al-Ahram Weekly in recent years acknowledge that Egypt is abandoning close to three decades of minimum engagement with the continent they are uncertain about the extent of Cairo’s re-engagement and wonder if it is simply trying to bolster its position over its claims to Nile water that could be undermined once the Great Ethiopia Renaissance Dam (GERD) begins operations. “I think it is unfair to suggest that Egypt is only keen on resolving its disagreements with Ethiopia over the operation of GERD, though protecting Egypt’s water security is a perfectly legitimate goal,” said one Egyptian official who spoke on condition of anonymity. In 1995 president Hosni Mubarak survived an assassination attempt following his arrival in Addis Ababa to participate in an AU summit. Subsequently, the president’s security team adopted a better-safe-than-sorry policy towards presidential visits to African states. “Mubarak may have missed Arab summits but his top aides never stopped visiting African states and he also received African leaders,” says the official. 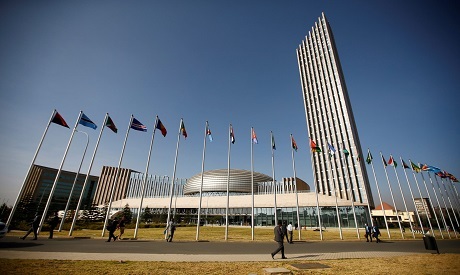 The role of the chair of the AU, in theory at least, is to help grow the organisation’s influence and ability to promote peace, security, development and inter-African cooperation. Inevitably, the performance of the various chairs has been uneven. Rwandan President Paul Kagame, who will be handing over the chair to Al-Sisi on Monday, had used his country’s leadership of the organisation to improve the AU’s performance. He was involved in promoting political settlements of ongoing feuds and tried to build a consensus around promoting continental interests. On Sunday, 24 hours before his presidency of the AU ends, Kagame is expected to chair a meeting in the Ethiopian capital to promote better healthcare in Africa. Kagame is often compared to his predecessor at the AU, Chadian President Idriss Déby, who opted for a relatively lower profile. “Kagame had good ties with the international powers that could make or break a peace deal in Africa. He was also accepted as a relatively neutral arbitrator by concerned African parties,” says one diplomat. Egyptian officials say Al-Sisi is determined to be an engaging chair of the AU. They point out that since Egypt was elected the president has been heavily involved in preparing Egypt’s agenda for its chairmanship of the pan-African organisation. On Monday, as Foreign Minister Sameh Shoukri was leaving Cairo for Addis Ababa to attend the summit’s preparatory meetings, Al-Sisi had already held discussions to finalise Cairo’s plans. A statement issued by Al-Sisi’s Spokesman Bassam Radi said that a detailed plan had been formulated to expand African cooperation, peace and security and to promote the 2063 Africa Development Agenda which is largely based on greater economic integration. Earlier, Prime Minister Mustafa Madbouli said Egypt will work during 2019 to promote cultural cooperation among AU members and closer relations among the continent’s youth. Egyptian officials say that beyond the overall plan, Cairo will use its presidency to seek political settlements to ongoing conflicts, including in South Sudan and Libya. Egypt’s presidency of the AU will now run simultaneously with plans to host the African Football Cup in June after Cameroon, the original host, was disqualified for poor preparations.